The most extensive salt desert on the planet with twelve thousand square kilometers is the only natural attraction that can be seen from outer space. The Uyuni Salt Plain extends like an enormous, flat, white prairie. At 3,650 meters above sea level, it is a natural point for satellite calibration because of its huge, completely flat and white surface that is smooth and highly reflective. The longest extent from east to west is around 250 km, and from north to south some 150 km where there are no landmarks. Located in the Bolivian Department of Potosí, the area currently occupied by this great salt plain was covered by Lake Ballivián around 40,000 years ago. The silence on the plain is complete, leaving one with a deep, directionless sense of solitude and isolation. The majesty of this immaculate, white salt expanse is awe-inspiring. A sensation of complete freedom yet disturbing disorientation invades the spirit. 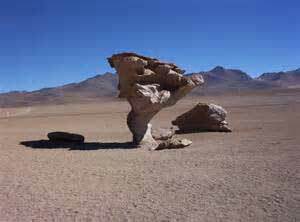 This is why tourist guides almost worldwide always schedule this impressive and mysterious place for a visit on the Altiplano. 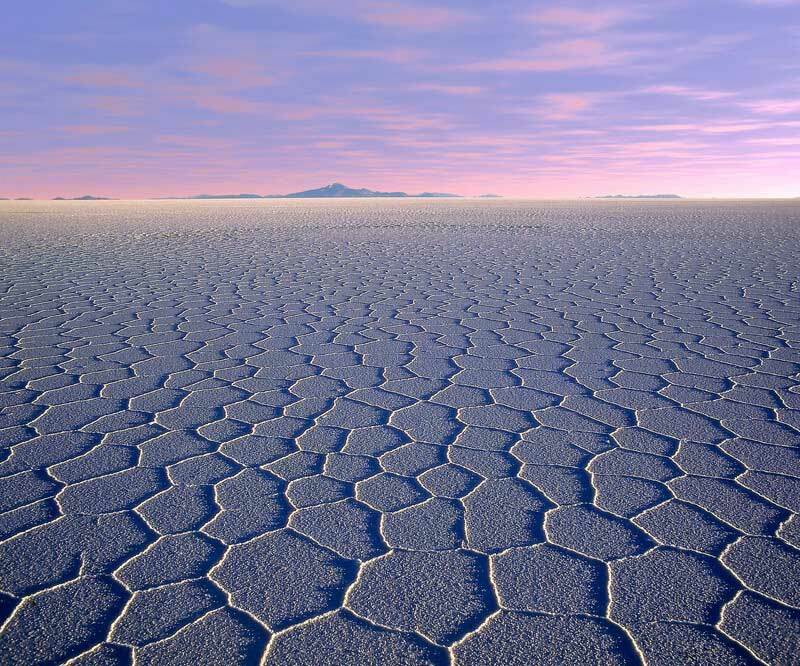 The Uyuni Salt Plain is not only the largest in the world; it also contains significant mineral reserves, being considered the greatest reserve of lithium on earth which is calculated at some 140 million tons. It also contains boron, potassium, magnesium, and sodium carbonates and sulfates. While it is a most impressive tourist attraction for the reasons previously mentioned, it becomes a nursery every November when young flamingos are raised in the waters of its significant lagoons. With their usual rosy color, they are frequent visitors to the red lagoon that gets its name from the reddish color of its water due to sediments and algae. Several islands and lagoons splash this fantastic landscape with distinct impressions and coloring. The Isla del Pescado (Fish Island) at the center of the plain is spectacular for its cactus forest that adds even more interest to this incredible landscape. The lagoons, including the red and green or Cañapa Lagoon, an intense blue, that paint this white canvas and the flocks of flamingos give movement to the otherwise static picture. Active volcanoes dominate the landscape to the south, like the Ollagüe Volcano across the Chiguana Valley. Sulfurous vapors sprout from the peak of the volcano which are also present in the sulphate formations near the Sol de Mañana (Morning Sun) geyser. The small craters around the geyser where white vapors gush dramatically present a true vision of Hell, and the odor of sulfur makes it difficult to breathe. 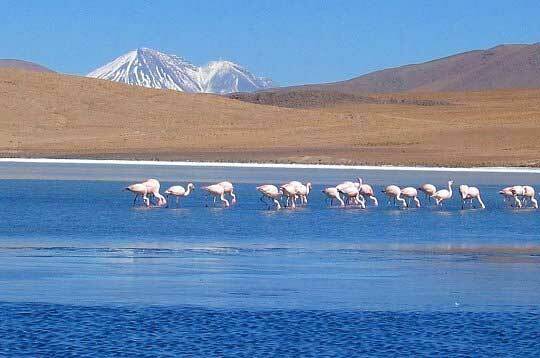 However, the Chalviri salt plain is near this infernal vision with its large lagoon filled with flamingos. Along the side of the road, there are natural thermal springs whose waters are just the thing to make the difficult trip worthwhile. Wandering along the Uyuni salt plain can be a surrealistic experience. It is a place where dreams and reality live side by side and feed each other with the vivid images of the Siloi Pampas, a desert prairie that is unending and solitary where there are no plants or animal life. This is the only place where an artistic mind can explain the world of fantasy created by the wind in the volcanic rocks and the variety of colors on the snowy peaks. The “stone tree” or the different animals and faces sculpted by this able artist are part of the scene from the “Rocks of Salvador Dali,” the master of surrealism who is honored by this name. The light reflected by the white landscape makes this a veritable paradise for photography, including both the attractions on the plain and among the people of Uyuni. 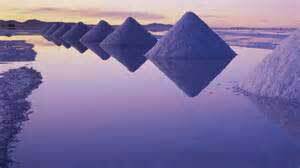 A salt hotel (build of blocks of salt) rises up like a defiant architectural work in the immensity of the salt plain. The Luna Salada Hotel is located in Colchani, about 30 minutes from the town of Uyuni. The entire hotel is built from blocks of salt, including the furniture. The visible roof beams and thatch give it a rustic style that combines with the unfinished wood of the doors and windows. Another attraction in the town of Uyuni is the train cemetery. This museum of antique trains is not familiar to the ordinary tourist, and it opens a door to the past of the town of Uyuni when mining reaching its peak there hurried up the arrival of these machines. Now it reminds us of a sneaky fever that is a part of the attic of our history. Forgetting the idea of a difference between being awake, alive, dead or asleep is easy in a place like the Uyuni Salt Plain. No one should deprive themselves of such a redemptive, self-explanatory, contemplative and deeply personal experience.